Just returned from a great couple of days walking the LONG MYND and STRIPERSTONES never realised has some great walking and superb views. This pic is taken from the top of the Long Mynd plateau. Much Wenlock in Shropshire is well worth a visit especially to the guildhall chambers that have been the home of the local council and courts for centuries as well as the market place below the hall. Dulmaston Hall located between Bewley and Bridgnorth beside the River Severn in Shropshire. A National Trust property worth a visit. Nice walks in the grounds - not the oldest house but interesting - does not seem to a have a lot of history prior to mid 1800s considering a hall has stood on the grounds since 1100. Still plenty to explore and some extensive grounds. The Long Mynd in Shropshire. Superb walking and cycling rewarding in some stunning views over the surrounding countryside. More info about cycling the Long Mynd. Wilderhope Manor - a pleasant countryside walk ... more. There are numerous National trust properties to explore ? Dudmaston Estate which has miles of paths to explore. Attingham Park with its mansion, walled garden and many parkland walks. Another house to explore is Benthall Hall at Broseley. 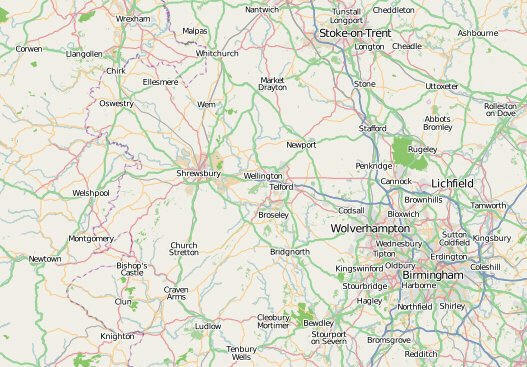 Near to Telford is Sunnycroft ? as with all National Trust properties please check their opening times. Cycling can be done on the Jack Mytton Way and Shropshire Way. Hawkstone Park is a very interesting place to visit with Follies to explore in a very unusual and rugged terrain. Take your torch as there are dark tunnels to explore. Hawkstone is in the North of the county.